Microsoft Exchange Server has been a crucial technological breakthrough in advanced corporate communication systems. Companies who utilize an enterprise-class email server like Exchange believe that email is mission critical, and value the productivity it enables. 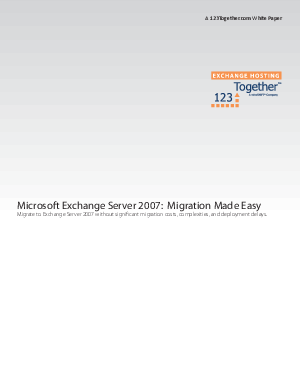 But an in-house migration to Exchange 2007 from an earlier version of Exchange or another email program will not be an easy task. Complexity, time and cost issues loom large over the IT department and are causing IT directors to search for an alternative solution. This white paper will discuss the hurdles which you will need to overcome and what you should be aware of before you start down the road to Exchange 2007 deployment.